Nothing like my child's birthday makes me happy and yet so sad at the same time! I love that they are growing up and that our interactions grow and mature. I am trying not to think of the next stage in our lives, empty nest and all. So today we will celebrate her day and not think about what will be. 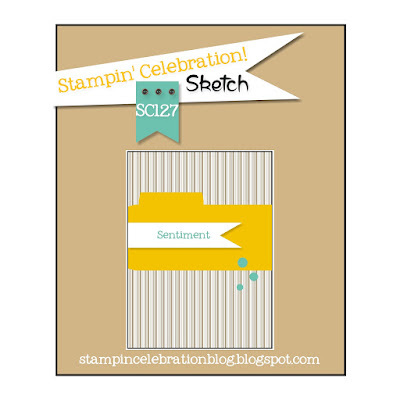 Given that my creative time has been somewhat limited of late, it was great to be able to use inspiration already available from Stampin' Celebrations newest sketch challenge (SC127) to help me create a card for my daughter's birthday! She is sweet 16 today! Can' believe it. Anyway, since she isn't really into cars, I decided to make her card more festive for the occasion. For some reason the Big News stamp set (Stampin' Up! 2015-16 Annual Catalog) was on my desk and the birthday greeting was looking me in the face. Then, when I went to pick a paper for the background, the Schoolhouse Designer Series Paper was right in front. I loved the polka dots and I couldn't believe how easy the card came together in my mind. A festive card for my daughter's big day! My project is pretty true to the sketch, and I am glad the other designers provided additional interpretations to help provide further inspiration! I am looking forward to seeing what inspires you from this sketch!